The Trex 450LP ARTF RC helicopter is Align's latest 450 size (spinning 325mm rotor blades), ready to fly package offered specifically to the beginner collective pitch RC helicopter enthusiast. It replaces their 450 Plus which has been such a great machine to learn and progress on; and was missed for over a year until this little beastie was finally released. Most collective pitch helicopter size for the price. Best overall value! Long flight times compared to micros (6-10 minutes - flying style and setup dependent). Not overly intimidating to self learn on. Fly and behave like larger RC helicopters - ie. predictable and not squirrelly. Good long term value like larger RC helicopters - ie. not a disposable purchase. Good growth potential for all flying types & styles. Scale fuselage options if you later decide to give scale a try. I have done many write-ups and reviews over the past 10 years now of various 400/450 size ready to fly heli packages. Blade's 330X and now Align's 450LP ARTF, are the two top current contenders in this market. 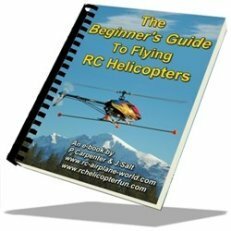 The type of beginner looking at 450's as their first or perhaps second collective pitch RC helicopter will be serious about getting into the hobby. These are the people I like helping the most. Let's face it, throwing down $500.00+ USD requires a considerable commitment. 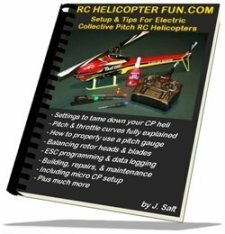 It's not nearly as much as we used to have to spend to get into this hobby back in the nitro only days ($1.5K or more); but spending this much on a collective pitch RC helicopter package is still costly compared to a harder to fly, but less costly $200 RTF micro. You therefore better have a fairly decent understanding of what you're about to get yourself into, especially if you're self learning. If you've spent any amount of time on this website of mine, chances are you do understand and are informed. Trex 450LP ARTF Design Features Important To You. The first thing of note that sets this ready to fly 450 apart from the competition is the use of a full carbon fiber frame set over plastic. Convenient sliding carbon battery tray, frame mounted tail servo tray, and red/silver anodized aluminum frame/motor mount frame bracing are direct parts from Align's higher end, 6S powered 450L Dominator. A helical main gear is used to reduce gear whine noise. The one piece main bearing blocks have integrated pitch, aileron, and elevator cyclic servo mounts for rigid and simplified servo installation - looks good too. Again, all features utilized with the original 450L Dominator kit. In fact, other than the power system and rotor head, plus the fact it's already fully built, the Trex 450LP ARTF is essentially the same high quality helicopter. 3S Power - Saves you $ or gives you more packs! I never understood the use of 6S power (22.2 Volt LiPo packs), on 450 size machines for anything but hard 3D flight. It's like learning to ride a sport bike with a 1200cc engine opposed to a 600cc. No way you will need all that extra power, at least for quite some time. Since the Align 450LP ARTF heli is meant for beginners, it's using a beginner friendly 3S (11.1 Volt) LiPo battery and power system. I'll tell you right now, even a 3S powered 450 is very powerful so don't think you will quickly outgrow it. I know very few people who have the skill to appreciated the added performance of 6S when swinging 325mm rotor blades. That kind of power in this size segment is only required for hard smacking 3D stuff; and very few ever get to that high skill level. Going with 3S power basically halves your LiPo battery costs; so instead of getting only two or three LiPo packs, you could get four or six for the same price. This allows you to have more back to back flights which is so crucial when you are first learning. Nothing, is more frustrating for beginners while practicing a new skill and almost being to the point of grasping it when you realize you have no more charged packs at the ready and are forced to pack up for the day. It's not only frustrating, it lengthens the learning curve substantially. There is not a single person I have ever instructed that wanted more power from their helicopter while learning the basics; many however have wished for more flight time. Having more LiPo packs gives you that ability. Since 3S 2200 mAh LiPo batteries are so common place in our hobby, you can find many examples for very good prices (usually under $20 bucks per battery). The Align 3S 2200 mAh pack that comes with the package is about 104x36x22mm in size if you want to know approximately what physical size 3S 2200 mAh packs to be looking at. Most are all in this size range however. As you have likely already seen, the Trex 450LP ARTF comes with Deans connectors on the ESC and LiPo pack, so make sure you get extra 3S 2200mAh packs with Deans already on. That or be able to solder your own on. 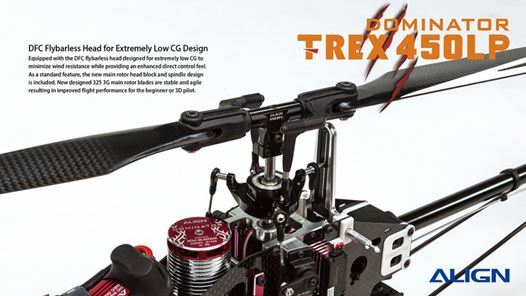 The Trex 450LP ARTF includes the same high quality Align ESC that come with the 6S powered 450L - the RCE-BL45P. Since this ESC is rated up to 6S voltage (22.2V nominal); converting the 450LP to run with 6S LiPo power should you ever feel the need, is an easy and fairly inexpensive upgrade. 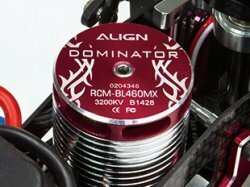 You would just have to change the motor out to the Align RCM-BL460MX 1800KV one used in the 6S powered 450L. Other than the 3S powering method, the 450LP also uses fiber re-enforced plastic blade grips and DFC linkages instead of metal on the 6S powered 450L. In fact the "P" in LP, is the plastic designation. The head-block itself is still full metal, using both a Jesus bolt and two pinch bolts providing skookum shaft fixation. For a beginner machine, having plastic grips makes good sense. It lowers costs a bit, reduced weight a bit, and adds a little extra "mechanical fuse" protection to save servo gears because the plastic will either break, or flex enough to absorb blade impact energy. The other nice benefit that plastic blade grips give the beginner is a little added stability due to rotor blade "coning" as well as dampening by way of blade grip flex. It's not extreme levels of coning & dampening of course, but is noticeable if you fly an LP back to back with an L.
Speaking of "L", this has been Align's way to designate the "long" or "stretched" version of their helicopters. Basically a slightly longer tail boom is used from what is standard. This gives you more heli size for basically the same price. It also improves tail rotor authority by way of more boom leverage, and thus allows one to run lower head speeds if so desired. 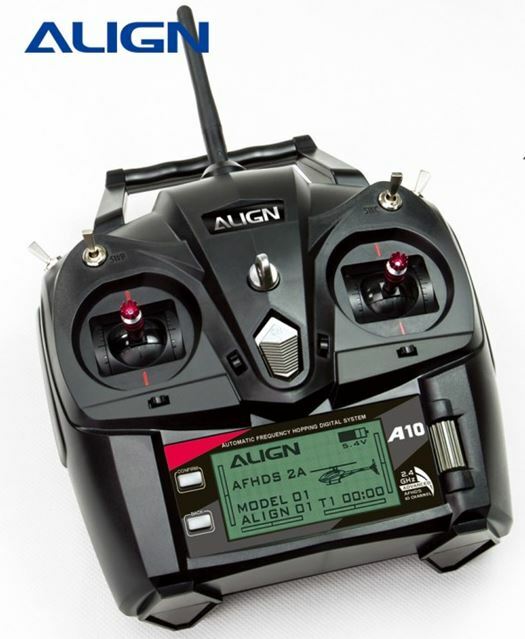 Align's previous ready to fly 450 Plus for example was 634mm long, while this new 450LP version is 705mm long. Align's T-Rex 450LP ARTF uses a torque tube over a belt driven tail rotor. I hear the moaning already. For those that know me, I'll take a torque tube (TT) any day of the week over a belt. I despise belts, plain and simple. But I think I'm in the minority here, especially considering a beginner friendly RC helicopter. Biggest issue... They are not as tail strike friendly. If/when you have a tail rotor ground strike, a torque tube won't absorb much energy or skip a clog tooth like a belt will. Instead, the tail rotor strike energy will generally strip out the tail rotor umbrella gears or tail drive gear on the main shaft. When instructing people with TT's, in addition to training gear that you must be using regardless of tail drive method, I'll generally mount a longer tail fin or some other form of protection on the tail fin to keep the tail rotor from kissing the ground. That really helps minimize TT gear stripping incidents, but it's still not as tail strike friendly as having a belt drive. So why would Align decide to use a more costly TT over a belt? It simply comes down to the fact it's way easier to mount the tail boom with a TT over that of a belt; and since this heli requires us to mount the boom out of the box, that's the primary reason - ease of assembly. Mounting the tail boom? A good segue into our next topic. 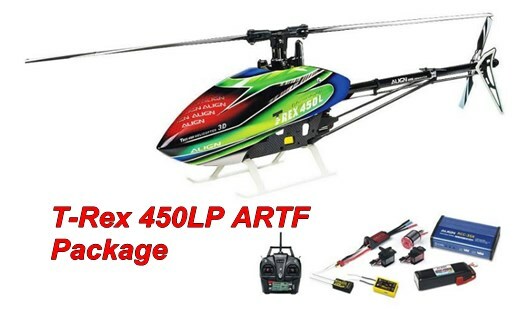 Over and above the T-Rex 450LP pre-built helicopter, the ARTF package comes with all these goodies. Most as we have already seen come pre-installed into the helicopter. It's a "spin" on the much more common RTF (ready to fly) designation, and stands for Almost Ready To Fly as there is some assembly required (fitting the tail boom and main rotor blades). 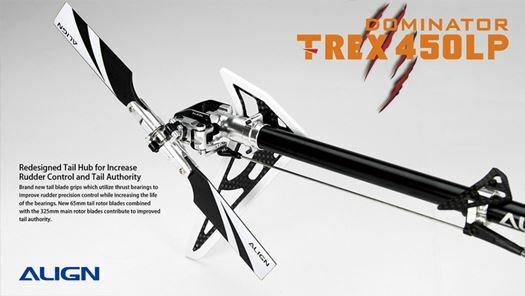 Please note, there are two different canopy versions of the Trex 450LP ARTF floating around. The first version is that red, blue, yellow striped one shown in the video. The latest version is coming with the subjectively much nicer looking red, blue, green we have all come to admire on the higher end 450L kit canopy. Professionally painted fiberglass canopy color aside, both 450 LP ARTF versions are the same and have the same components. 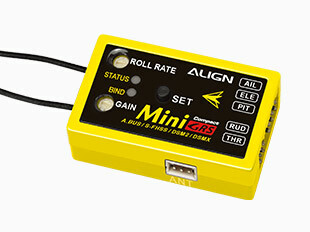 These 4 servos are controlled directly by Align's latest Mini GRS flybarless system. It uses a traditional 3 axis 12 bit MEMS gyro (no self level or rescue accelerometer help). This little FBL unit has been around for several years now and performs well for the most part. It supports heli sizes ranging from the 250 up to the 500, and is pre-configured to the 450 size for use in the 450LP. It has a built in Futaba S-FHSS receiver. It has a Spektrum DSM2/X Satellite RX Input. It allows A-BUS connectivity to the included A6B RX (more on the included radio system shortly). The Mini-GRS is super easy for the beginner or anyone else new to flybarless stabilization for that matter. There are only two primary adjustments - cyclic gain rate, and cyclic roll rate (agility rate). No computer or Bluetooth connectivity required as both are easily adjusted by two potentiometers (pots). Beginners will want the gain adjustment pot about half way (12 o-clock), and the agility pot to its lowest setting (about 7 o-clock). They should already be set at these values out of the box and will give a very docile responding bird. Now we get into the obvious departure from what we've been used to with Align's RTF 450's & 250's - the radio system and protocol. Up to this point, all ready to fly T-Rex's used Futaba's S-FHSS protocol. You can of course still use a S-FHSS Futaba radio with the 450LP since the GRS flybarless system comes with a built in S-FHSS receiver. 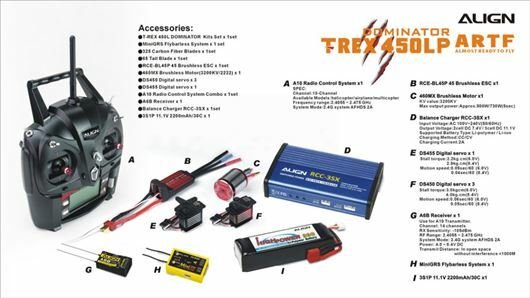 The Trex 450LP however now ships with the new Align A10 radio/transmitter which is using FlySky's 2.4 GHz spread spectrum AFHDS 2A protocol (Automatic Frequency Hopping Digital System). It therefore needs a separate AFHDS compatible receiver which Align is calling the A6B. This RX utilizes an A-BUS network and connects to the GRS flybarless system via the 3 wire A-BUS communication cable. Clean install. As I mentioned in my T-Rex 150X review, the obvious reason Align went this direction was to cut costs. No doubt, using FlySky's radio architecture is less expensive than using Futaba's. This is actually a decent lower cost 10 channel radio, and one I feel is an improvement on the Align T6 (Futaba J6) that Align included with the previous 450 Plus; at least from the stand point of a better user interface and better menu layout for helicopters. A roll style slider is used to scroll through menu options providing a quick setup. 20 models memory, three aircraft options (helicopter/airplane/multirotor), Modes 1-4 available with optional direction output, set buzzer warnings, and supported firmware upgrades. The overall feel and quality however was lacking in my opinion and it's not a radio I would want to use for the long term if I was just getting into the hobby. As I say so often to the point of ad nauseam, "the radio is more important than the helicopter." This is not to say you won't be able to learn to fly the 450LP and enjoy it with this radio. It works well for that and most importantly, is computerized allowing you to properly setup your 450LP. No ready to fly RC aircraft is going to come with a top line radio. They come with the minimum to get you started to keep the overall price of the package reasonable. 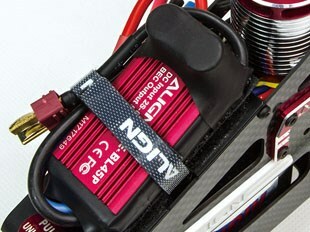 The plus however with the Trex 450LP ARTF is it comes with the Mini GRS flybarless unit allowing you to get a better Futaba S-FHSS computerized radio down the road. Or a Spektrum, or an FrSky with multi-protocol module, or one of those new multi-protocol computerized radios. Lots of radio options in other words will work with it, so you are not stuck with some obscure radio system and protocol if and when you decide to upgrade. For the sort term however, the A10 will work perfectly fine. The last item to cover is the included LiPo charger that comes with the Trex 450LP ARTF package. 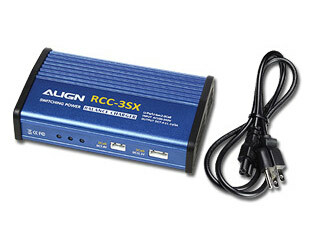 It's the same RCC-3SX 2 Amp, 2S & 3S LiPo balance charger that came with the Trex 450 Plus. This is a decent little LiPo charger that can be plugged into any standard wall outlet. It charges through the balance plug of the battery ensuring all 3 cells are correctly balanced to the same voltage and has 3 LED's indicating the charge status of each cell in the pack. Charge time of an 80% depleted 3S 2200 mAh LiPo battery pack will take about one hour. It will get you going and is adequate as you begin. Once you know you like the hobby however and have more LiPo's to charge, it's time to start looking at proper more powerful computerized chargers. Many who are considering this helicopter will most likely also be looking at the Blade 330X. I get this exact question several times a week right now and what my opinions are between the two. First off, both are great 3S powered, ready to fly, 450 size helicopters to start with, and I personally feel you won't go wrong with either. They are different however and depending on your situation, one may check off more boxes than the other. Better radio in terms of usability & setup. Better looking helicopter (yes - subjective). Carbon fiber frames over plastic body on the 330X. Same basic helicopter as the higher end T-Rex 450L. Torque tube efficiency & simplicity. More expensive by about $60 USD over the 330X. Parts may be harder to source since Align is not carried at most local hobby shops like Blade is. Carbon frames are more rigid and higher quality, but the plastic body of the 330X often survives crashes better. Torque tube is more likely to strip gears over the belt used in the 330X. Not 100% fully assembled like the Blade 330X is out of the box. You have to fit the tail boom on the 450LP. Align is generally for a more experienced flier as they don't have the same level of customer support offered by Blade/Horizon Hobby. To be perfectly honest, even I would have a hard time choosing between the two. Both are wonderful little machines and both fly very well. I guess the first thing I would do is see about parts availability where I lived. If the local hobby shop has Blade but not Align, the 330X would be more appealing. If I had no local hobby shop and had to order online regardless, the point is moot. I don't like either radio that comes with the 450LP or the 330X so no real stand out winner in that department. That said, at least the Align A10 radio is a proper computerized radio, usable out of the box so you can properly setup your birds for any flying style you wish. The Spektrum DXe that comes with the RTF 330X is all but useless, and why I strongly suggested in the review I did on it, getting the BNF version of the 330X along with a proper DX6e radio. That combination will bring the cost of the 330X slightly over the Align 450LP. 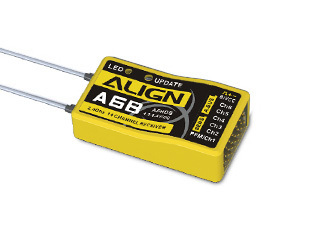 The Align Mini-GRS and Spektrum AR636A flybarless systems are fairly equal in performance. Both are beginner friendly, and do the job. They are not up to the versatility or performance of higher end flybarless systems, but for the intended use on both these helicopters, they work well. 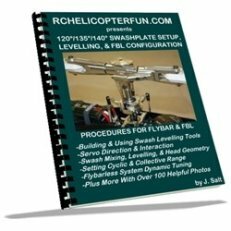 No flybarless system advantage between either ready to fly heli package in other words. So, which would I choose? I fly both Blade and Align, but no question, my heart lies with Align. They are simply better built and better quality helicopters. The 450LP has higher end components for not all that much more money and would be the one I chose over the two; but you must decide what pros and cons of each top your list. My Collective Pitch Essentials eBook Combo Package - Save 25% over regular individual eBook price.